As the weather cools I gravitate toward soupy dishes and my favorite soups always have lots of noodles like this delicious Won Ton Noodle Soup. The soup is quite eclectic with its variety of ingredients. It has hearty meat-filled dumplings, savory roast pork, succulent shrimp, leafy greens, oodles of egg noodles, sprigs of fresh herbs and a sautéed garlic topping to add the right amount of spice. (Are you drooling yet?) This belly warming dish is a great meal to make when you have leftover roast pork as you don’t need much for this recipe. As for the home-made won tons, with practice, you’ll get really good and can wipe out 16 of these dumplings in a matter of minutes. If you don’t have time to make the garlic topping, you can buy it at your Asian grocer. (This topping is fantastic to have around and adds wonderful taste and texture to soups and stir fry.) You can’t go wrong with this one-bowl wonder! Enjoy! 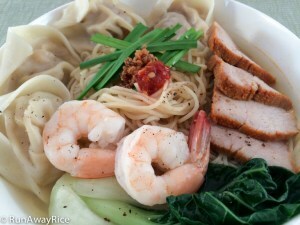 If you enjoyed this recipe, you may also like: Vermicelli Soup with Chicken, Steamed Pork Roll and Egg (Bun Thang) and Thick Noodles and Fish Cake Soup (Banh Canh Cha Ca). Remove noodle bundles from packaging and place in a large colander. Use your fingers to loosen the strands. Bring a large pot of water to a rapid boil. Drop the noodles into the water. Stir the noodles in the hot water and cook it for just 1 minute. Pour the cooked noodles into a large colander and rinse several times with cool water to stop the cooking process. Toss the noodles in the colander multiple times and remove as much of the remaining water as possible. Place a piece of paper towel on a large plate. Spread the noodles evenly on the plate and allow to air dry. Cut the shrimp into thin slices. Add shrimp to the pork along with all seasonings. Mix everything together combining all ingredients well. Take a won ton wrapper and place it on a cutting board with one of the corners pointed toward you. Place approximately 1/2 tablespoon of filling in the center of the wrapper. Dip your finger in water and run it along the top edges of the wrapper. Take the corner closest to you and fold it over, lining up the edges to form a triangle. Gently press your fingers along the edges to seal the wrapper. With your index finger, gently push up at the center point of the won ton making a small indentation. Dip a your finger in water and dab the right corner of the won ton. Now pull the 2 corners together so the wrapper overlaps. Pinch the wrapper together to seal. Continue making the won tons until all of the filling is used. Bring a large pot of water to a gentle boil. Drop the dumplings into the hot water, a few at a time. Gently stir the won ton making sure they don’t stick to the bottom of the pot. Cook the dumplings for 5 minutes stirring occasionally. Don’t allow the water to boil too rapidly or the dumplings will break. Use a slotted spoon to remove the dumplings and place into a colander. Allow to drain. Add minced garlic and oil to small skillet. Saute the garlic over medium high heat until it’s golden brown–approximately 2-3 minutes. Add chicken broth, water and onions into a stockpot. Cover pot and bring the broth to a boil. Turn the heat to low and simmer for 5 minutes. Remove the onions and discard. Taste the broth and add more salt if desired. Add the bok choy and cook for 1 minute. Turn off the heat and add the shrimp. To serve, add a generous amount of noodles into a bowl. Drizzle 1/2 tsp of sesame oil on the noodles. Add the won tons, roast pork, bok choy, shrimp and fresh chives to the bowl. Ladle a generous amount of broth filling the bowl. Spoon a bit of the garlic topping. Sprinkle with freshly ground black pepper. Enjoy while hot! Love your recipe: simple, easy to follow & DELICIOUS! Hi chi, came across your blog today and was amazed by your cooking and presentation. This looks tastier than what I get at my local restaurant. You do nice work!